Trouble's favorite food group is pizza. I guarantee if he is asked what he wants for dinner he will always say pizza... or candy. This recipe is my attempt at a semi-healthy pizza crust. In a bowl, dissolve yeast and brown sugar in the warm water (not so hot you can't touch it). Let sit for 10 minutes or until you see some life (little bubbles). Mix in the flour. I use the hook attachment on my mixer. Place the dough into an oiled bowl and cover with saran wrap. Place in a warm spot. I let the oven get a little warm then turn it off. Let the dough rise until it has doubled. (This should take about 1 hour). Punch down the dough and allow to rise another 30 minutes. Turn dough out onto an olive oil greased pan or several small pans. Press dough to cover the bottom of the pan. Let dough rest in the pan while you preheat the oven to 425 degrees. Pre-bake the pizza crust for about 10 minutes before topping the pizza. Top the pre-baked crust with your favorite toppings. Bake until the cheese and crust are golden brown, about 15 to 20 minutes. Good looking pizza! You must enter it to my blog event - Excellente! I make my own pizza too; it's really a favorite of mine - homemade is the best! Yours looks awesome! We have regular Pizza Night here at The Cottage and we will sure have to try your crust. It looks awesome. 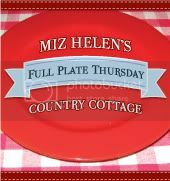 Thank you so much for bringing it to Full Plate Thursday and please come back! I am always on the lookout for a good pizza crust - I love making homemade pizza! Thanks for sharing this with us at the Hearth and Soul Hop! Yhis looks really good! i definitely would love to try out a new pizza crust recipe, so I'll give this a try.